Fehim Taştekin, an analyst specializing in Turkish foreign policy and Caucasus, Middle East and EU affairs and founding editor of Agency Caucasus, explores why Chechen militants are fighting in Syria. He notes that while the largest group of Chechen militants — the Jaish al-Muhajireen wal-Ansar or Army of Emigrants and Helpers, led by Abu Umar Al Shishani — has cooperated with the Islamic State of Iraq and Ash Sham, it has not sworn allegiance to ISIS and has been trying to find a way to break with ISIS for some time. The piece goes some way to explain a recent video statement by the second-in-command of the Jaish al-Muhajireen wal-Ansar, the Caucasian militant Seyfullakh, who announces that he has formed a new brigade independent of ISIS and Jabhat Al Nusra. The report also explains one reason why Moscow is concerned about “foreign fighters” in Syria, and their connection to “Al Qaeda-linked groups”. Tastekin begins by asking why Chechens — who for centuries have fought a single enemy, the Russians — are joining the “global jihad” and turning up on the battlefield in Syria, when it has been generally accepted that unlike groups such as the Islamic State of Iraq, Chechen fighters are not motivated by a Salafist Jihadist ideology, but a Sufist ideology specific to the Caucasus. So why have some Chechen militants turned to global jihad and why are they fighting in Chechnya? There have also been reports of some Chechen militants among those killed in Afghanistan. According to Tastekin, the new phenomenon of Chechen militants joining the jihad in Syria is related to changes in the Chechen resistance that occurred during the Second Chechen War in 1999. The Caucasus Emirate, proclaimed in 2006 by Doku Umarov, initially transferred the war in Chechnya to other Caucasian republics. The struggle of Chechens turned into a multinational design, involving the participation of militants from different ethnic groups such as the Circassians, Karachays, Balkars, Ossetians, Nogais, Dargins, Lezgins, and Avars. Eventually, the struggle left the borders of the Caucasus. Now this diversity is reflected on the Syrian front. Syria emerges as an important step in the integration of Caucasian militants into the global jihad. 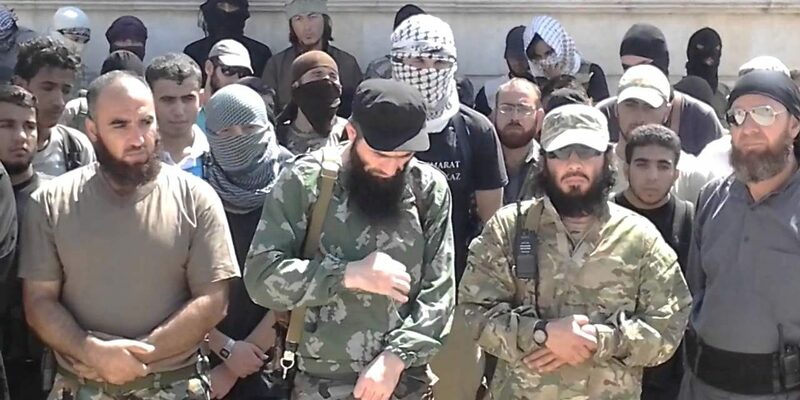 Caucasian fighters in Syria soon found themselves at the forefront of the insurgency, with the Khattab Brigade formed by Abu Umar Al Shishani [the brigade eventually formed into the Jaish al-Muhajireen wal-Ansar, or Army of Emigrants and Helpers]. According to Taştekin, Al Shishani is a Kistininan [Kisty is an Georgian name for local Chechens] and like the Chechens living in the Pankisi Gorge in Georgia, speak a language from the Vainakh language group. The name of the Khattab Brigade comes from the Jordanian militant Emir Khattab — also known as Habib Abdul Rahman — who worked with Chechen mujahideen in the First and Second Chechen Wars after fighting the Soviets in Afghanistan. Khattab’s Salafist ideology had some influence on Caucasian militants fighting in Chechnya. The Khattab Brigade — which later formed the Jaish al-Muhajireen wal-Ansar — fought in and around Aleppo with both the Free Syrian Army and Islamist faction the Islamic State of Iraq and Ash-Sham but according to Taştekin avoided swearing any oath to ISIS leaders. Most of the group’s fighters have origins in the Caucasus, though it is not known how many are Chechen diaspora who settled in Syria in the 19th century. One main factor attracting Caucasians to fight in Syria is Moscow’s support for Syria and the Assad regime. For many Caucasians, therefore, the war in Syria is a continuation of the war in Chechnya. Some of the fighters are wanted by Russian security forces back home in the Caucasus, and see Syria as an escape route from the police and the security services. Yet others are Caucasian refugees who had a hard time in Turkey, and came to Syria, some of them with their families. “Mohammad” said that while Al Shishani does operate with the Islamic State of Iraq, he is trying to move away from its leader, Abu Bakr Al Baghdadi. ** Taştekin says that, in fact, it was Al Shishani who sold the flour plant’s equipment.